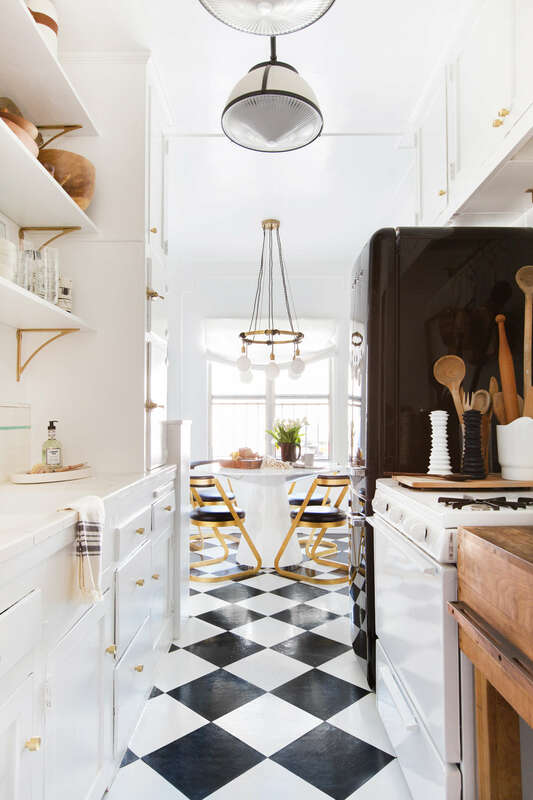 Linoleum, dingy diners serving $2 coffee, and Formica countertops: These may be the first things that come to mind when thinking of checkerboard flooring, but there is a way to make this retro kitchen style feel fresh. We’re seeing a resurgence of the pattern in home design (hint, hint: keep an eye out for our winter issue), and if you’re planning to renovate in the next few months the kitchen is the best place to start. Perhaps the biggest drawcard of this trend is its versatility. Try the checkerboard design in marble, tile, painted hardwood, or even vinyl, depending on budget and aesthetic. Opting to lay the tiles on the diagonal for a more modern look, Tolbert says the peel-and-stick checkerboard floors as the perfect solution for renters. “It took one afternoon and was under $50 to redo the entire floor. It transformed the look of the kitchen and is still one of my favorite elements in the room,” he says. So whether you too are renting or renovating, give checkerboard a chance. Here are some of our favorite spaces that prove the “dated” trend can be re-done in a manner befitting 2018 and beyond. Here, checkerboard is used to infuse bold style into a small kitchen. It perfectly plays off the matte black accent walls, which provide an edgier contrast to butcher block counters and simple white cabinets. If it’s good enough for the south of France, it’s good enough for us. Try your hand at a rustic, French-country style kitchen by opting for checkerboard in more subdued tones, like a pale gray or even light blue instead of black. We’re loving the way this kitchen combines a shiplap ceiling, subway tile backsplash, and checkerboard floors. The patterned flooring adds another dimension to an already eclectic space. If your kitchen has older wood floors in need of a revamp, try a fresh coat of paint. A strategic paint job can go a long way in completely changing the character of a room—just think how different this kitchen would look with regular hardwood. A checkered pattern, paired with that gorgeous pale blue retro fridge, balance out the contemporary features of the space in a unique, visually exciting way. Linoleum flooring may not be for everyone, but in some cases, it looks just right. This bright and airy kitchen is an example of the latter. Whitewashed features and rustic wooden counters help keep the space from veering into kitsch territory. Plus, this checkerboard approach is a great way to add in some color via the flooring.